Because of their large magnetized volume, tokamaks could be used to detect the elusive particles that are postulated to constitute dark matter/dark energy. A huge chunk of mass appears to be missing from the Universe. The billions and billions of galaxies that telescopes observe, the giant gas and dust clouds that float in the immensity of intergalactic space account for only a fraction of what is really there. The rest is invisible and remains undetectable. 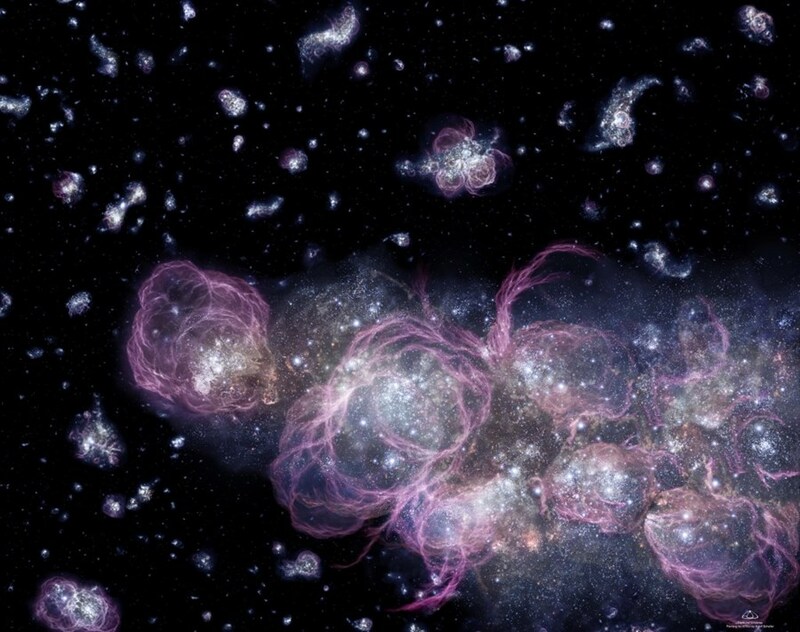 The existence of a "dark matter" permeating the Universe and accounting for such gravitational phenomena as the rotational speed of galaxies or the "bending" of light around massive astronomical objects was inferred by cosmologists as early as the 1930s. Theories were established that remain unconfirmed to this day. Decades later, observations of the accelerating expansion of the Universe led cosmologists to postulate the existence of another mysterious entity, a force whose nature can only be surmised— the so-called "dark energy". It is generally estimated that the mass-energy content of the Universe is made up of approximately 74 percent dark energy, 22 percent dark matter and only 4 percent ordinary matter such as stars, planets, dust and intergalactic gas. 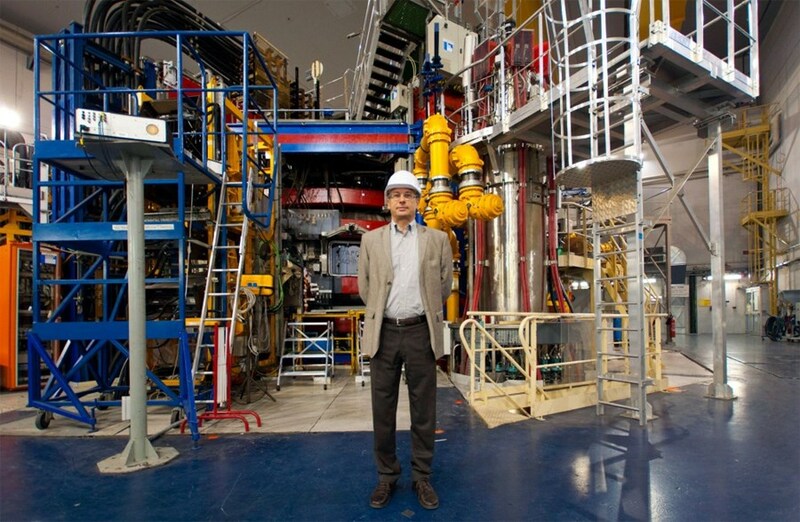 Dr Jean-Claude Vallet, of CEA's Institut de Recherche sur la Fusion Magnétique (IRFM), is participating in the preliminary discussions with CERN and ESA on turning Tore Supra into a part-time dark matter detector. There is a consensus among cosmologists and particle physicists that "exotic" particles are key to understanding dark energy and dark matter. Dubbed "chameleons" (they are able to change their own mass) and "axions" (in reference to the US detergent Axion because their existence may help to clean up some theory problems) these hypothetical particles have been assigned a set of properties that would explain the behaviour of the Universe. As of today, however, both chameleons and axions have escaped detection. Axions and chameleons are postulated to interact weakly with matter (they traverse it as if it didn't exist) and to change into photons via the "Primakoff effect" in the presence of an intense magnetic field. However, experiments aimed at confirming their existence, like the CERN Axion Solar Telescope (CAST) in Geneva, have failed, to this day, to detect either axions or chameleons. The CERN Axion Solar Telescope (CAST) came online in 2002. It has not turned up definitive evidence for solar axions but considerably narrowed down the range of parameters where these elusive particles may exist. CAST, which is basically a 9.2-metre-long dipole magnet aiming at the Sun, has a strong magnetic field (~9 T) but a rather small magnetized volume (~ 0.06 m³). "Since the probability of producing a photon by the Primakoff conversion of an axion is proportional to the magnetized volume multiplied by the magnetic field squared," says Dr Jean-Claude Vallet, of CEA's Institut de Recherche sur la Fusion Magnétique (IRFM) "with Tore Supra (31 m3), we have a device which, equipped with the proper detectors, should be at least 150 times more efficient than the CAST experiment." Tore Supra would also be considerably more powerful than the Axion Dark Matter eXperiment at the University of Washington, USA, which stands as the reference in axion detection today. There is a striking historical parallel to the project of using Tore Supra, a fusion installation, for the detection of hypothetical particles. The existence of neutrinos, a particle that was postulated in 1930 by physicist Wolfgang Pauli, was confirmed in 1956 by placing a detector in one of the early US fission reactors at the Savannah River Plant (Georgia, USA). Frederick Reines, who had conducted the neutrino-confirming experiment with colleague Clyde Cowan (deceased in 1974), received the Nobel Prize in Physics in 1995 in both of their names. And there's more. "Tore Supra would also make a very decent detector for solar chameleons. To further improve its intrinsic quality, our colleagues at CERN suggest that we couple one or more X-ray telescopes of the XMM type to our tokamak and aim them at the Sun, where solar chameleons are postulated to originate ..."
In this configuration, the X-ray telescope, positioned just outside the tokamak, would be aligned with both the Sun and the detectors inside the vacuum vessel. Reactions to the proposal of using Tore Supra as an exotic particle detector have been very enthusiastic here in Cadarache and at CEA headquarters in Paris. "The way we operate, doing 'plasma campaigns' interspersed with periods of pause and maintenance, leaves room for hosting these new and unexpected experiments," says Vallet. "We believe that we could provide up to 12 weeks of observation in the coming two years." Preliminary discussions are ongoing between CERN, IRFM and the European Space Agency (ESA) that owns the XMM X-ray telescopes. 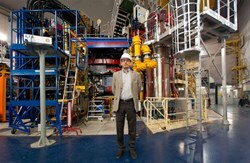 A "strategic plan" should soon be finalized and submitted to the CERN Council in July. Tore Supra's potential, assures Vallet, is recognized by the international community of cosmologists and particle physicists. By entering a part-time quest for axions and chameleons, the CEA-Euratom machine could contribute to unveiling one of nature's most nagging mysteries.